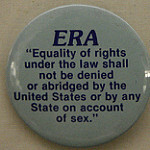 A new coalition is forming, designed to bring together various groups in North Carolina to support passage of the Equal Rights Amendment to the US constitution. The Board of Directors of AAUW NC agreed that AAUW NC will serve as a Lead Member of the new ERA Alliance in North Carolina. This means that AAUW NC will have members on the board of the new alliance. The official roll out of the Alliance and its work will be on April 12 at Wake Forest University. Diana Gray will represent AAUW at the roll-out. The April 12 meeting is free and open to the public, but space is limited, so please do register.